The objective of this lab was to perform various tests using knowledge learned in class, to decipher an unknown culture by utilizing different agar plates and test tubes to select, differentiate and bio chemically test the unknown. This experiment was performed in two consecutive periods. The unknown culture #31 was found to be Serratia marcescens. Its striking feature was its production of red pigment observable on H2S test tubes. A schema diagram of how I identified the unknown is at the end of this report. In period 1 the following materials were obtained and procedures were performed. Unknown test tube culture #31 was selected. In addition to Bunsen burner and inoculating loop, different medias to culture and grow the unknown were assigned. This includes. In the case of Mannitol Salt Agar the streak plate technique was used by performing the following procedures. An inoculating loop is sterilized by flaming it using a Bunsen burner. The inoculating loop is cooled down. The cap of the unknown culture was removed from the top of the tube and was also flamed for sterilization. The inoculating loop was inserted in the unknown tube to pick up culture. The the top part of the tube was then passed again over the flame. 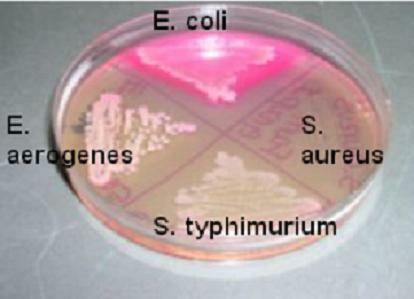 The culture is streak on the plate using the streak plate technique and aseptic technique. culture was picked up using the aseptic technique and introduced on each of the test tubes. After these procedures, the culture was disposed and the inoculated plates and test tubes were placed in the refrigerator until the next period. The inoculated plates and tubes were analyzed. From the Mannitol Salt Agar (MSA) test, my unknown was discovered to be gram negative since it was not a lactose fermenter. After gram staining, my unknown was observed and reaffirmed that it was gram negative since it stained red which was the color of the counterstained sufranin. Furthermore, it was obvious from the microscope at oil immersion power that it had short rods (bacilli) characteristics. Once gram negative and bacilli shape were known, possible microorganisms could be identified based on class handout including. Also from the MSA plates the unknown culture was observed to have the following colony description. Below is the result of bio chemical tests. Some tests were unnecessary to deduce the unknown microorganisms. A flow chart is included detailing my thought processes and how I arrived at the unknown which was Serratia marcescens. Innoculate culture on the MSA plate using the streak method. Selective since it allows only the growth of high salt or saline loving organisms. Differential since manitol fermenter organisms change the red pH indicator color (neutral) to yellow (acidic). Non-mannitol fermenters do not change the color of the media. Usually allows the growth of Staphylococci especially for differentiating Staphylococcus aureus from others. Innoculate culture on the MAC plate using the streak method. Contains bile salts and crystal violet as its selective agents inhibiting gram positive bacterial growth. 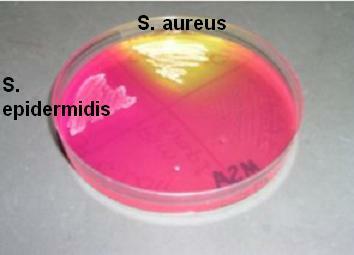 Differential since lactose fermenter organisms (coliforms) give red color. Non-lactose fermenters give colorless colonies.